Uses Damage Boosting, Invisible Barrel, and Beetle Clashing to perform the Wrong Warp. On the platform where you get the invis, you want to load the right beetle on camera first to set up the IDs. The final throw is tricky, as you need to be somewhat close to the bonus. Throwing a little bit after you touch the wall is a good visual cue for the final throw. Roll off the edge with Dixie. Once Dixie is in the water, hold Y and Up-Right. 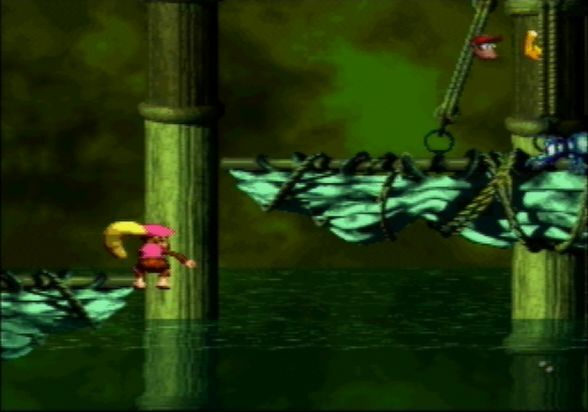 Press B once to swim upwards. If done properly, Dixie will be at the top of the water. 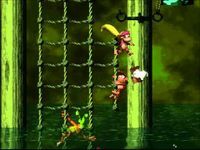 At this point, press select to switch Kongs. After pressing select, you want to be holding Y and Up-Right. 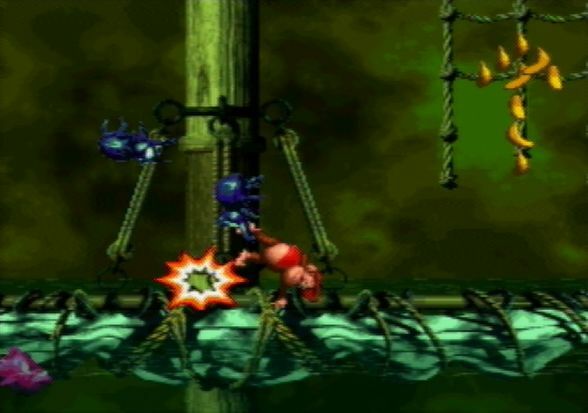 You can mash B to ensure you get the jump on time, but the fish shouldn't be able to hurt you anyway. The water swap used in this video is outdated, but still viable. 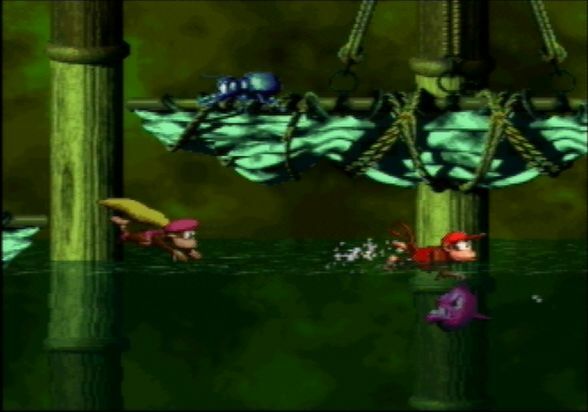 With a little practice, most players find the optimal water swap much easier overall, since it requires no mashing. Some extra rope jumps and trickier movement included over the safe tape. You'll need to throw a little sooner than you would without the jump if you're using the wall as your cue. 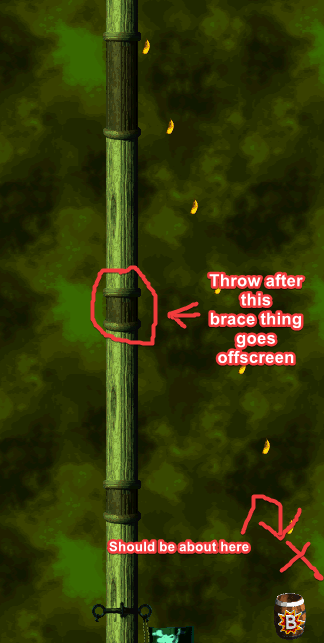 With an optimal jump, throw as soon as you hit the wall. Jumping to the left without loading the right beetle is faster, but is prone to random failures. Use these setups at your own risk (Saves ~1.1s). 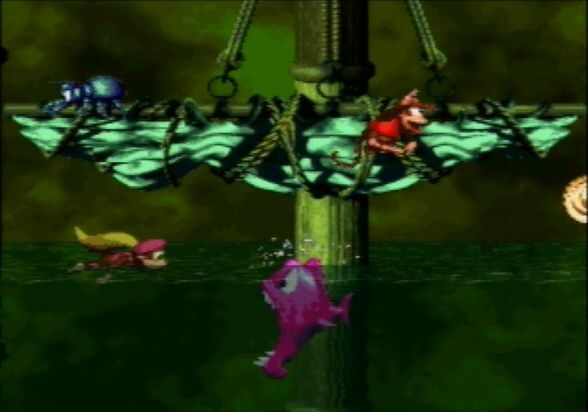 If you lose a Kong attempting to team swap in water or accidentally enter the level with only 1 Kong, you still have a shot at getting the wrong warp! You can wait and lure out the fish further to the right before diving in and swapping, for more safety. Do what you feel is comfortable to juke him. 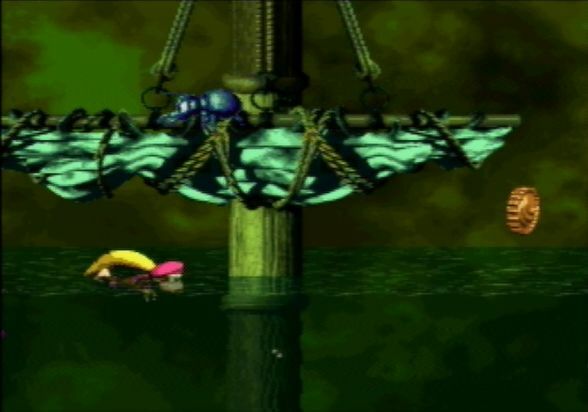 To get the damage boost properly, make sure you swim to the top of the water before the fish attacks you. Swimming up before swapping can also increase your rate of success. You can damage boost with the beetle on the platform too. The result is the same. 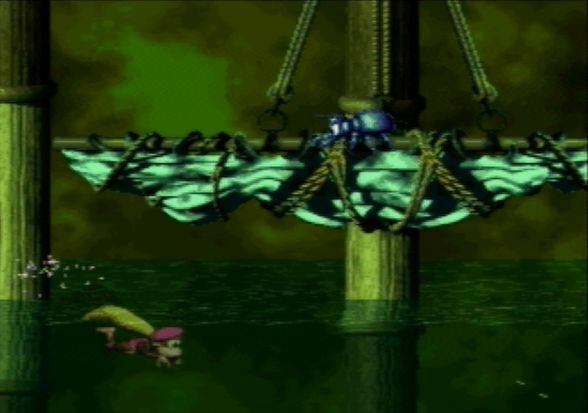 The other video demonstrates how the warp can be performed with Diddy, if you lose a Kong climbing the ropes. This page was last edited on 16 March 2019, at 02:58.